Ukraine war: Allegedly Russia-backed rebels advance. 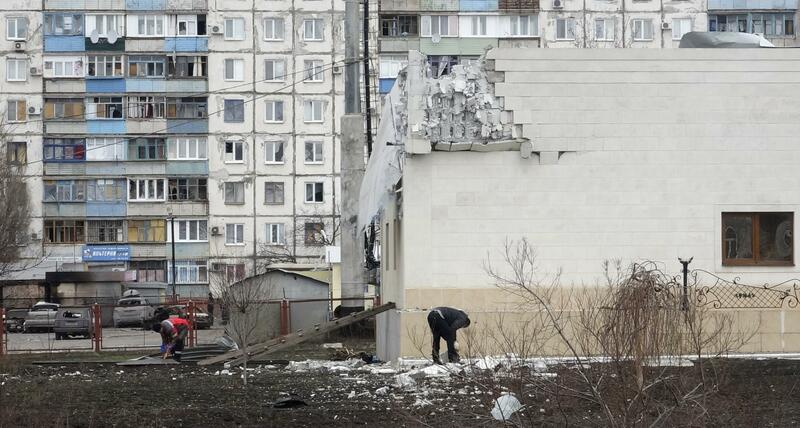 Shelling damage in the port city of Mariupol, Ukraine. Violence in eastern Ukraine is at by far its worst since a ceasefire was agreed last September. Casualties have mounted, including in the major port of Mariupol where Kiev says 30 civilians were killed in rebel shelling on Saturday…The Kiev government sees the rebel advance as a repudiation of the ceasefire, restarting a war in which 5,000 people have been killed. Kiev and NATO believe thousands of Russian troops are in eastern Ukraine fighting on the rebels’ behalf with advanced weapons, despite Moscow’s denials. The European Union will hold an emergency meeting Thursday to discuss sanctions. President Obama told reporters he is “deeply concerned” about the latest developments and that the U.S. will respond jointly with its European allies.